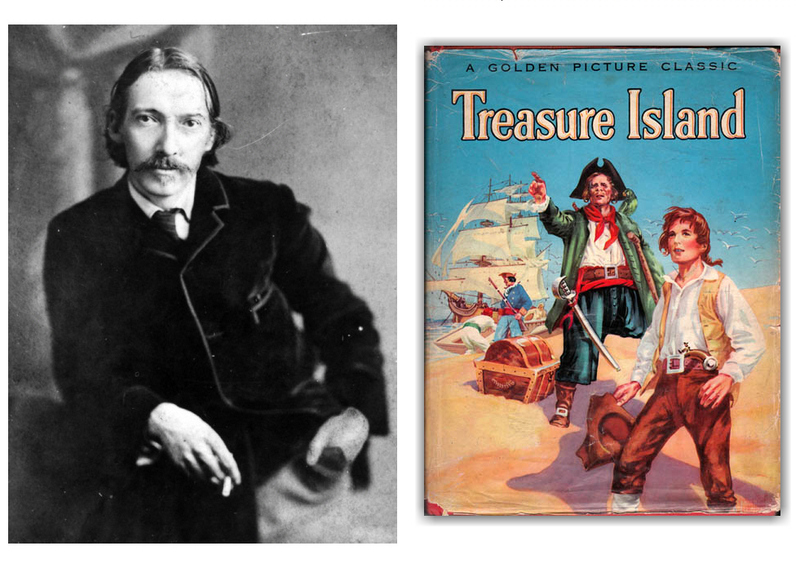 With 'Treasure Island', the Scottish lawyer-turned-novelist Robert Louis Stevenson effectively invented the whole genre of Pirate Stories, converting vicious bandits into jolly tars. The influence of Treasure Island on popular perceptions of pirates is enormous, including such elements as treasure maps marked with an "X", schooners, the Black Spot, tropical islands, and one-legged seamen bearing parrots on their shoulders. Squire Trelawney, Doctor Livesey, and the rest of these gentlemen having asked me to write down the whole particulars about Treasure Island, from the beginning to the end, I, Jim Hawkins, take up my pen in the year of grace 17- -, and go back to the time when my father kept the "Admiral Benbow" Inn, and the old seaman first took up his lodging with us. I remember him as he came up to the door with his sea-chest carried behind him - a heavy, brown man with scarred hands and a sabre-cut across one cheek, breaking out into that old sea-song I was to hear so often: "Fifteen men on the dead man's chest-Yo-ho-ho, and a bottle of rum!" The inn pleased him, for it had very little company, and nearby there was a cliff from which he could scan the sea for ships. He spent a great deal of time on the cliffs. I noticed that he never went into the main room of the inn until he had examined the company there. He was anxious about something, and I was presently made the sharer in his alarms, for he promised me a silver four-penny a month if I would keep a weather-eye open for a seafaring man with one leg. This man haunted my dreams. When the captain got drunk, he would sing wild sea-songs, and tell dreadful stories of hanging and walking the plank, and wild deeds on the Spanish Main. Once he became so violent that Dr. Livesey, who had come to see my sick father, threatened him with the law. Early one morning, a pale tallowy man wanting two fingers of his left hand came to the house looking for the captain, whom he called "Bill." The captain was frightened to see him. I heard the sound of quarrelling, the clash of steel, and saw the man whom the captain had called "Black Dog" running from the house, the captain pursuing him. The man escaped, and the captain, over-wrought by the excitement, was seized with a stroke. When he had partially recovered, he told me that if anything happened to him, I was to take care of his sea-chest, which was what his enemies were after. My father died. The day after his funeral, a blind old seaman came tapping at the door. He demanded to be taken to the captain, and so strong was his grip on my arm that I was forced to obey him. He dropped something into the captain's hand and skipped out the door. "Ten o'clock!" cried the captain, reeled, and fell to the floor dead. Fearing the return of Black Dog and his friends, my mother and I hastened to the neighbouring hamlet for aid. The people there were so terrified that they would not help us, except to send a messenger to Dr. Livesey. But my mother determined we must go back alone to get the money that was due us. As we searched the captain's body to find the key to the chest, we noted a little black round of paper on the floor, the black spot, and on the other side the words: "You have till ten to-night." It was then only six, but as we counted out the money due my mother from the captain's chest, I heard the tapping of the blind man's stick upon the road. Seizing what money we had counted and an oilskin packet we had found in the chest, we fled from the house As we hid under the low arch of a bridge we heard the men battering their way into the house. When they found us and part of the contents of the chest gone, they were wild with anger and began to search for us. We would have been lost; had not the revenue officers, who had been met by the boy sent for Dr. Livesey, come galloping up. The men fled, but the horses ran down the blind man and killed him. One of the officers took me to find the doctor, who was at the home of the squire. After the officer had left, the doctor opened the oilskin packet. The packet contained a sealed paper, a map of an island, with its location carefully marked, and in red ink the notation: "Bulk of treasure here." This paper must have been the precious thing which the pirate Flint had given the captain, who had been his first mate (as he had told me), when he lay dying, and this must be his treasure. The squire, in great excitement, offered to outfit a ship to search for the treasure. I was to be cabin-boy. The doctor agreed enthusiastically, but warned the squire, who was a talkative man, to hold his tongue. I remained at the squire's house while the squire went to Bristol to fit out a ship. After a short visit with my mother I joined the squire and the doctor in the sea-port. There we found that the squire had been talking rather too much about the treasure. He had engaged a one-legged man, Long John Silver, as ship's cook, and Silver had helped him find a crew. For a moment, when. I heard of Silver's one leg, I remembered the fear of the captain who had stayed at our inn, but when I saw the man, and observed how smiling and cheerful he was, I was sure he had not been the cause of the captain's terror. Once, when I was visiting Silver's tavern, I saw Black Dog, but he hurried away, annoying Silver very much because he had not paid his bill, and because, being a stranger, he probably would not return to do it. We were finally ready to sail on the Hispaniola. Her captain, Smollett, was worried about the trip. He found that the crew knew what he had not known, that they were going for buried treasure, and where the treasure was; and he was disturbed because he had not chosen his own crew. The captain feared a mutiny, and although the others laughed at him, they allowed him to make a garrison of the stern of the ship. The voyage proved fairly prosperous. The men were cheerful, and Silver took great pains to make and keep them so. All the crew respected and even obeyed him. He had a way of talking to each, and doing everybody some particular service. To me he was unweariedly kind, and always glad to see me in the galley, which he kept as clean as a new pin; the dishes hanging up burnished, and his parrot, who he called Cap'n Flint in a cage in the corner. In spite of his one leg, Silver was one of the most active men on board, and certainly he seemed one of the most trustworthy. It was only by chance that I learned otherwise. An apple barrel stood on deck that we might help ourselves whenever we wished. One night, when I went for an apple, I found the barrel so nearly empty that I had to climb into it. As I sat there, I heard voices outside, one of which I recognized as Silver's. To my horror, I learned that he had been Flint's quartermaster, and that he was now trying to make one of the men join him and the old pirates he had brought on board as crew. Hands, one of the men, was all for taking the ship over at once, but Silver had enough sense to know they were not able to set her course. His plan was to let Smollett sail the ship for them, let the squire and the doctor find the treasure, finish with them on the island, and make his way home with his rascals and the treasure. I was almost discovered when one of the men started to get himself an apple, but they all went off for rum instead. just then I heard the cry "Land ho!" We had come to Treasure Island. In the confusion I was able to whisper to the doctor that I had terrible news for him. He, the squire and the captain went to the cabin, and shortly thereafter sent for me. They were thunder-struck by my news. We were able to count three men who would be loyal to us, making seven against nineteen. It took us a long time to get the ship into its anchorage between the big island and little Skeleton Island, and the men were very sullen before we got through, in contrast to their cheerfulness on the voyage. Only Silver retained his good humour; one would never have known he was a traitor. The captain allowed the men to go ashore, thinking to quiet them, and I sneaked into one of their boats. I gave them the slip as soon as I landed, and ran off to explore the island. Hiding behind some low trees, I saw Silver talking to one of the seamen trying to make him join the mutineers. As they talked, a cry rang out far off, a death yell. The man walked away from Silver, shaking his head, and suddenly I saw Silver knock him down with his crutch, and then knife him. I fled. As I ran I saw a dark, shaggy figure leaping ahead of me. When he stopped I walked up to him, and to my surprise he flung him-self on his knees before me. He told me that he was Ben Gunn, and that he hadn't spoken to anyone for three years. Gunn had been in Flint's ship when he had buried the treasure and the six men who had hidden it. Afterward, sailing on another ship, he had passed the island, and persuaded his shipmates to hunt for the treasure with him. When they had been unable to find it, having no chart, the sailors had marooned him. While we were talking, we heard the sound of gunfire. 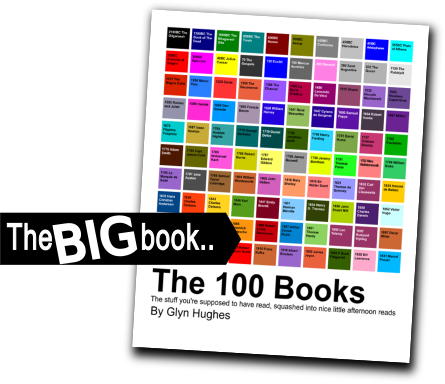 Running toward the noise, I saw the Union Jack fluttering above a wood. After most of our piratical crew had gone ashore, I decided to explore with one of the loyal men. Not very far from the shore, we came on a stockade enclosing a stout log-house. Inside the house was a spring. I at once determined that this was the safest place for us. Hurrying back to the ship, I gathered together those of us who were loyal, and we quickly stored a boat with provisions. One of the mutineers who had been left on board looked as if he could be persuaded to join us. We were able to add him to our band, and shoved off with a second boat-load of provisions. But the pirates had their guns ready now, and shot at us. Our boat sank under us a few feet from shore, and we had to flee to our stockade. We were pursued, and just as we came to the stockade Tom Redruth, the squire's old steward, was shot down. He died soon after we gained safety. We raised the Union Jack over our fort, and it was this which Jim saw as he came toward the sound of shots. When Ben Gunn saw the flag he stopped. He told me that he would not go into the fort with me, but that I would know where to find him when I wished. A white thing in the hand and the words "Ben Gunn has reasons of his own" would be the signals he would recognize. He told me where he had a little boat hidden, and then he ran away. The next morning Silver came with a flag of truce and tried to get the chart with a promise of our safety, but he went away unsuccessful. Later in the day the pirates attacked the stockade. Captain Smollett was wounded and two of our men were killed, but when the battle was over there were only nine of the mutineers left. Later in the day, the doctor went off to see Ben Gunn. I envied him his walk through the cool woods, and slipped out after him, though I knew I should not go. I wanted to find where Ben Gunn's boat was hidden. When I came to it I saw it was only a coracle made of goat-skin. Under cover of darkness, I manoeuvred her out to the Hispaniola. Only two men had been left on board her. Peering into the cabin window, I saw them with their hands on each other's throats. They were too drunk to know that I had cut the anchor-rope, and it was not until the ship began to move with the tide that they knew something was wrong, but they could do nothing. I lay down in my coracle and went to sleep, so tired was I, in spite of the danger I was in. When I awoke in the morning I was half a mile from the ship, which was moving drunkenly, as if no one was steering her. Suddenly a wind came up, and she skimmed before it. Down she bore on the coracle, and before I could think, my little craft had been run down, and I was clinging to the Hispaniola's boom. Then I saw the two watchmen: one stretched out as stiff as a hand-spike; Israel Hands propped against the bulwarks, his face white as a candle. The deck was spattered with blood. To my astonishment, Hands was still alive. When I gave him brandy, he revived still further. We struck a bargain to beach the ship on North Inlet, on the opposite side of the island from the stockade. I did not entirely trust Hands, which was just as well, for when he did not know I was looking I saw him secrete a dirk. While I was busy guiding the ship into the inlet, he started toward me with the dirk, and I turned just in time to save myself. I clambered up the mast a and seated myself on the cross-trees, but he climbed after me. I felt a blow, and I was pinned by the shoulder to the mast. In my surprise, the pistols with which I had been holding him at bay went off, and he plunged into the water. The Hispaniola ground into the sand. The schooner was free from buccaneers and ready for our own men to board. I made my way ashore and finally reached the block-house. Stumbling in the dark, I found myself in the midst of my enemies. Silver, his parrot sat on his shoulder, told me that he had given my friends safe passage from the stockade in return for our provisions. He tried to make me join his party, but I refused, telling him that I had been the cause of all the disasters which had befallen him. His crew wanted to kill me at this, but he restrained them. They wanted to kill Silver too, but by showing them the chart of the treasure, which Dr. Livesey had given him, he regained his old power over them. I awakened in the morning to find that Dr. Livesey had come to tend the wounded men. Having a chance to talk with him privately, I told him about the stranded ship. He was grateful to Silver for protecting me, and offered to help him if he could. Yo-ho-ho, and a bottle of rum!" I knew this was Ben Gunn, but the men thought it was a ghost, and were dreadfully affected. Finally they were able to go on. At last we came to a great excavation and found - that the treasure had been lifted! In an instant the men had turned against Silver. He and I faced them from one side of the pit. Just as they started toward us, three musket-shots rang out of the thickets. Two men fell dead, and the other three fled. The doctor, Gray, and Ben. Gunn joined us. It was they who had saved us. The treasure was safe in Ben Gunn's cave, where he had taken it, long before. The next morning we transported it to the Hispaniola, which we brought around to an anchorage near the cave. Leaving the mutineers behind, we set sail for the nearest port in South America. There Silver skipped ashore with a sack of guineas, and we were glad to be well rid of him. We made a good cruise home, and in due time reached Bristol. All of us had an ample share of the treasure, and used it wisely or foolishly, according to our natures.